The beautiful building at 408 W. Walnut recently occupied by the Callison-Lough Funeral Home is now vacant, but what is the story of this stately structure? H.L. Stroud founded Rogers’ first department store in 1884, just three years after the birth of the town. The Stroud Mercantile Store was very successful, and about 1898, H.L. Stroud built a fine new home in the 400 block of W. Walnut. The home was described in an article by Charley Stroud and Lola Morgan in an early edition of the Benton County Pioneer: “He built a fine new home for his family. He loved and owned many fine horses and carriages. The long brick building along the alley housed his horses and carriages. The upstairs was the servant’s quarters.” In 1912, Stroud remodeled his home and added rooms on the front, upstairs and downstairs, and beautiful porches, and gazebos. The home has been enlarged and remodeled since then, but it is in perfect condition inside and out, just as it was created by skilled craftsmen in the early 1900s. A.D. Callison and Will White began their business in Rogers in 1912 at 115 W. Walnut with a paint and wallpaper store downstairs and a funeral home upstairs. In 1920, Callison bought and remodeled the 117 building next door and moved both his paint store and funeral business into it. When Callison acquired the Stroud home, it was used as his office and funeral chapel until moving the entire undertaking operation to 408 W. Walnut in 1932. The carriage house in back of the main structure still exists and was used by Callison for storage for his paint store and funeral home. One unique feature that was added probably in the 1930s was a hand operated freight elevator that is still in use today. It is operated by a large pulley with ropes and lots of muscle. It is one of a very few in the state, but curiously, there is another operating one in Rogers from 1907 in the Rabbit’s Lair, formerly the Applegate Drug Store. The Callison Funeral Home has been associated with names such as McKinney, Porter, Foster, Croxdale, and Lough. In 1984, Max Lough bought the Callison-McKinney Funeral Homes in Benton County including the one in Rogers. The name was changed to Callison-Lough, and the name remained the same until 2014. Lough sold the business in the late 1990s and it was acquired by Dignity Memorial in 2007. 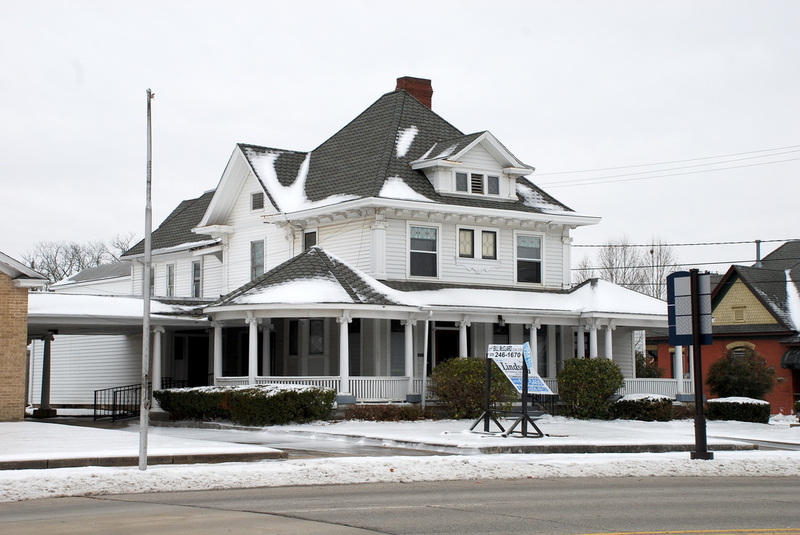 The service continued on W. Walnut until last year when Dignity Memorial, the parent company of Callison-Lough and Rollins Funeral homes, closed the old Stroud Home. They consolidated their Rogers’ operations to Rollins Funeral Home on Highway 102 and placed the Stroud home up for sale. Hopefully, the new owners will preserve this beautiful historic home for future generations.